Address: Ancient Cottages, Kersey St., Hadleigh, Suffolk. 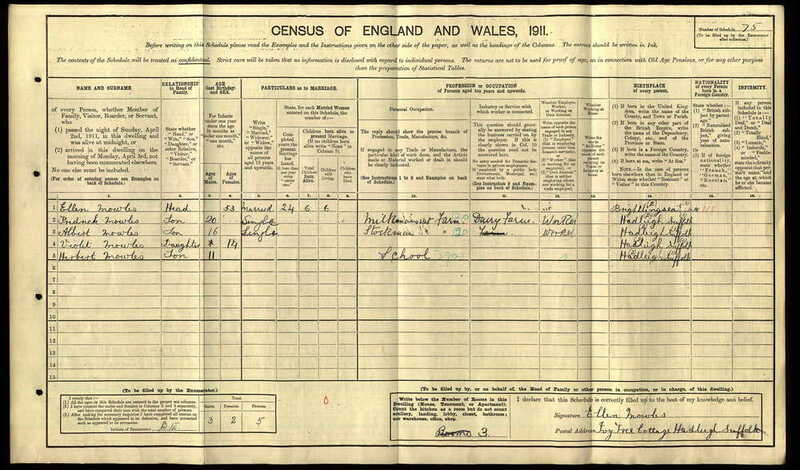 Frederick William Mowles was born on Cosford Farm, Hadleigh in 1892. His Mother Ellen was then 35 and his Father, George 33. 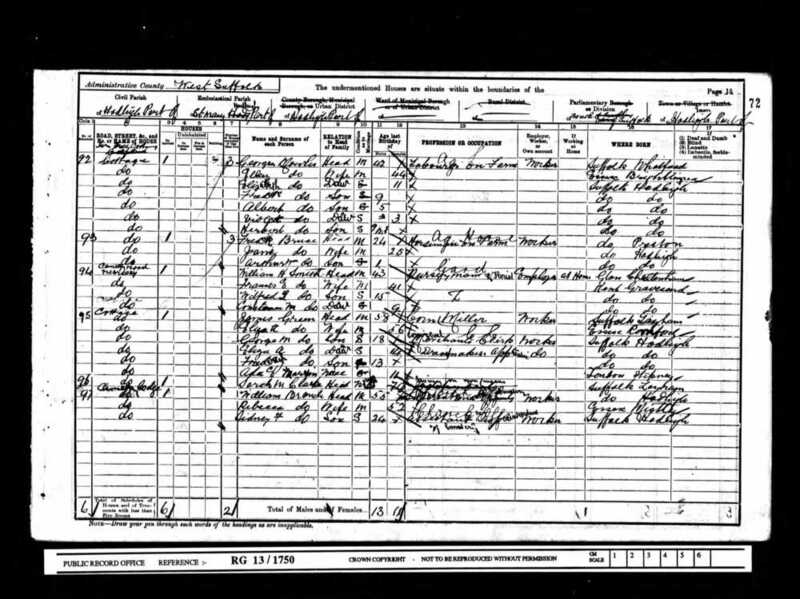 The 1901census records Frederick aged 9, his siblings Ellen 14, Elizabeth 11, Albert 5, Violet 3, and Herbert 9 months all living with their parents in the family home at Ivy Tree Cottages, Kersey Street, Hadleigh. From a young age Frederick worked on the farm as a milkman. He volunteeredto join the Army shortly after the outbreak of WWI on 7th August 1914, enlisting with The Suffolk Yeomanry also known as Duke of York’s Own Loyal Suffolk Hussars at B Squadron Headquarters in Stowmarket – a mounted division made up of many farm labourers selected for their experience with horses. The first part of their war was spent at Martlesham Heath, Woodbridge, Suffolk under the orders of the 1st Mounted Division where they underwent basic training and where they were billeted in huts. Whilst troop training they were inspected in the November by the King. By July 1915 they had moved to Leiston and this time they camped under canvas for further combat training. As The Suffolk Yeomanry had volunteered for service overseas, orders came through in September for the Regiment to be assigned duty in Gallipoli. Fighting would involve trench warfare and due to the terrain and logistical problem of transporting horses for an entire regiment of 500 troops it was eventually decided to dismount the regiment in preparation for service as infantrymen in Gallipoli. This was a great disappointment to the men, as they would be departing without their horses. 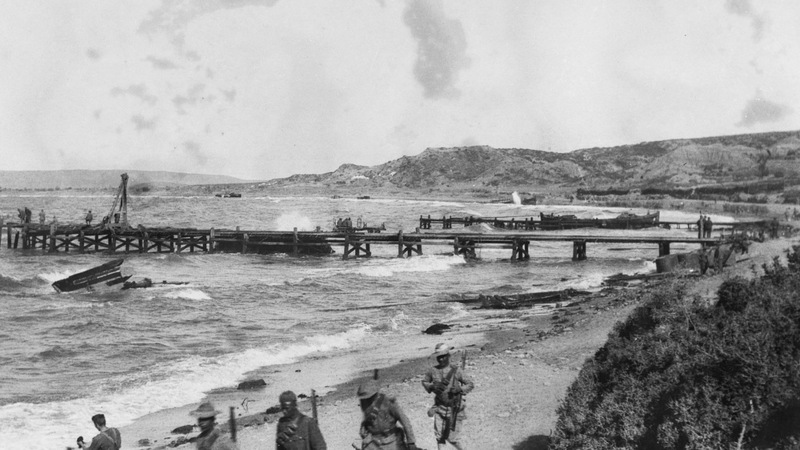 The eighth month campaign in Gallipoli was fought by Commonwealth and French forces in an attempt to force Turkey out of the war, relieve the deadlock of the Western Front in France and Belgium, and open a supply route to Russia through the Dardanelles and the Black Sea. 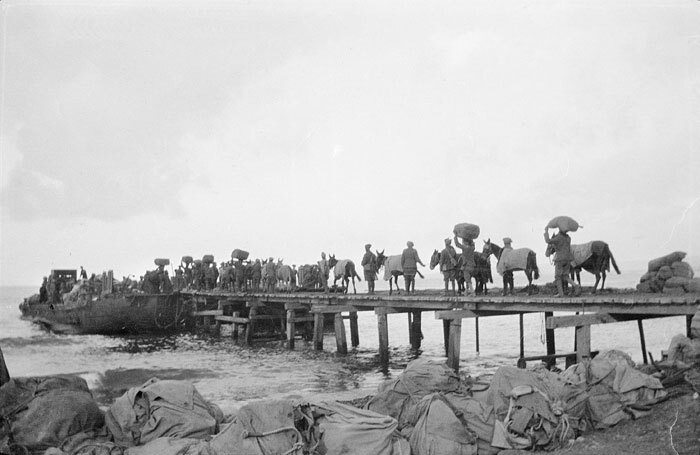 The Suffolk Yeomanry reached Gallipoli very late in the campaign. Their mission was to force through the Turkish lines and move forward taking Tekke Teppe Ridge where they would meet up with the Anzacs and encircle the Turks. Under the orders of the 54th (East Anglia) Division they anchored off the coast of Suvla Bay where they were ferried by lighters to land at Walkers Pier. They landed on the night of 10th / 11th October, directly into fighting and their immediate task was getting dug in and settled. The first few days on Turkish soil were spent in constructing dugouts in New Bedford Road gully. Over the coming weeks they continued digging trenches forming part of the extensive network built to access the front line whilst offering protection to the troops. 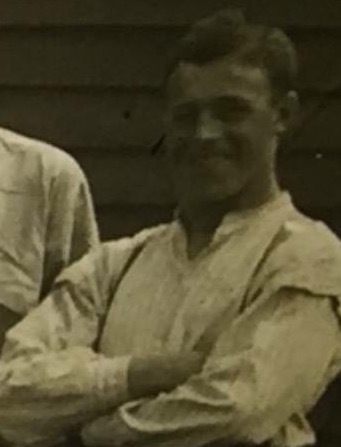 Early on the morning of the 23rd of September 1915 Fred’s regiment boarded trains to take them to Liverpool where they embarked on the White Star liner RMS Olympic, setting sail for the Dardanelles with 6,000 other soldiers on board. RMS Olympic was a large cruise liner and sister ship of the Titanic built before the war. Due to her size she was commissioned by the War Office to be converted to a troop carrier for conveying troops to far flung theatres of war. The passage was around eight days and conditions on board were cramped, dirty and their food supply quickly diminished. On route they stopped off on the island of Mudros on 3rd October 1915 where they had further training and acclimatisation to the heat of the Mediterranean before leaving for Gallipoli. Several days later they finally set sail for the Dardanelles on the liner Abbasia. During the daytime things were generally quiet except for occasional sniping and shelling. During the night rifle fire was incessant. Conditions were appalling because of the heat, flies and, lack of sanitation. Bodies lay on the battlefield decaying in the heat and consequently the whole region was swarming with flies which contaminated their food resulting in many soldiers contracting and eventually dying of dysentery. By mid October they had pushed forward to take Tekke Teppe Ridge. During this period Fred contracted dysentery along with many of his comrades. It was decided to evacuate the sick and the dying to one of the hospital ships lying out in Suvla Bay where they could be treated by medical staff. Due to the massive numbers of wounded soldiers, less urgent casualties were left on the beaches until transport and space became available to move them, sometimes this resulted in troops lying on stretchers on the beaches for days suffering in the heat. Fred was finally sent aboard the hospital ship HMHS Rewa for treatment, but sadly he died several days later on 30th October 1915 aged 24 years. He was buried at sea off the coast of Suvla Bay. Frederick's name is inscribed on the Helles Memorial on the southern peninsular of Gallipoli which lists over 20,000 Commonwealth soldiers who died in Gallipoli and have no known grave. He is also commemorated on the war memorial in Hadleigh, Suffolk. His regiment was ordered to withdraw and were evacuated from Gallipoli between the 3rd and 8th December 1915. As a campaign Gallipoli was a failure. It failed to open a supply route to Russia and failed to relieve the pressure on Serbia. It claimed the lives of 300,000 Ottoman and 265,000 Allied Forces and diverted much needed resources from the Western Front. 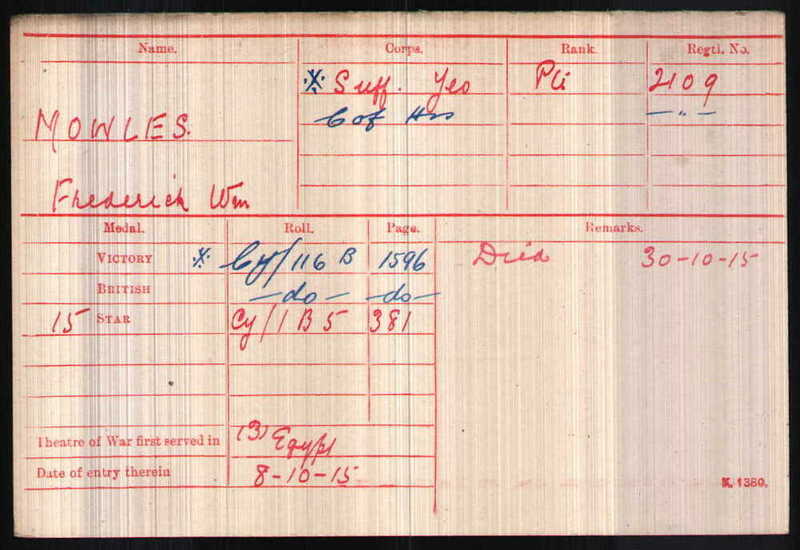 We hope that this page has been able to tell the story of Frederick Mowles. If you know of any information which might help to add to the story then please get in touch.